Ghostgate Defender is a rare Intelligence creature card. It is part of the Houses of Morrowind expansion. "We'll have to settle this the hard way." "We must hold the gate!" 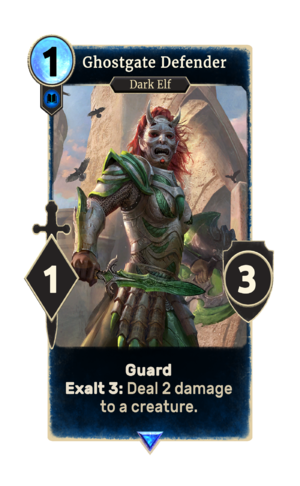 This card likely depicts Galdal Omayn, who first appeared in Morrowind as one of the highest ranking Buoyant Armigers of the Tribunal Temple. She was assigned to defend the Ghostgate from any and all hostile denizens of Red Mountain.